Hi Friends! How are you all doing? I hope you're having a splendid Autumn so far! In every shaker kit, you will find foam adhesive that is perfectly pre-cut to make shaker assembly super easy and fuss-free. What I love the most about these, though, is that the inside foam leftovers can be made into beautiful accents! After assembling a card I featured earlier this month, I had a pile of leftovers, and decided to use the inside bits for this next card. 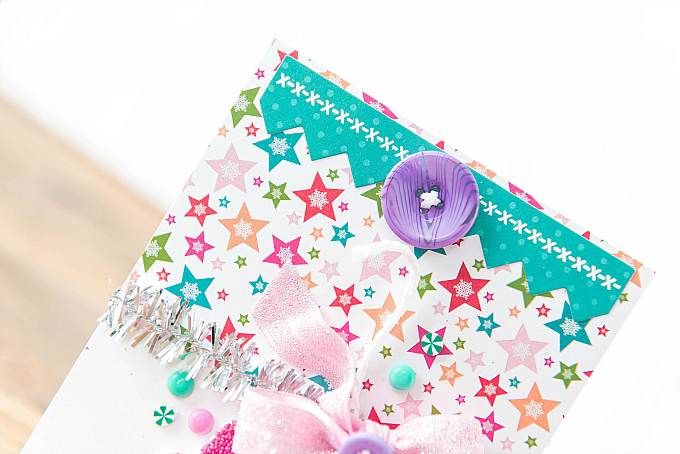 To start, I decked the top of the card using the festive star print, and teal dots from the kit, cut with PTI's Banner Border dies. I stamped and embossed a stitch detail at the top, and added a gorgeous purple button. 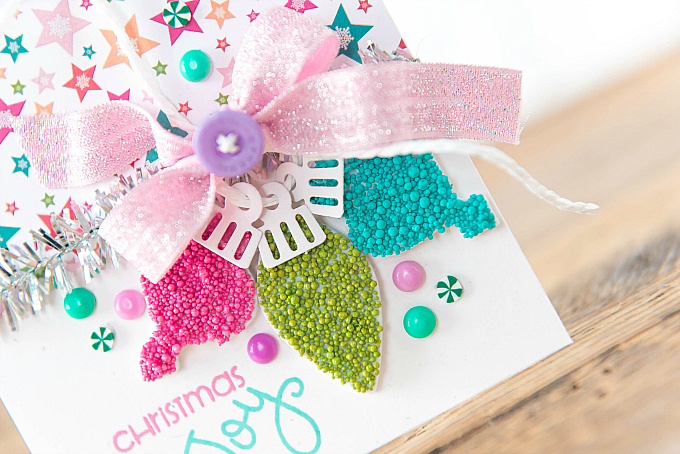 I used some tinsel trim to divide the card, and then started on my ornament cluster. I used a sparkly trim to make a bow, and some string to tie all the pieces together into a colorful cluster. For the ornaments, I used some colorful prills and found them to stick really well on the foam leftovers. In a few places where I needed a tad more tackiness, I just used a glue stick and applied some with my tweezers. I used colors from this set. 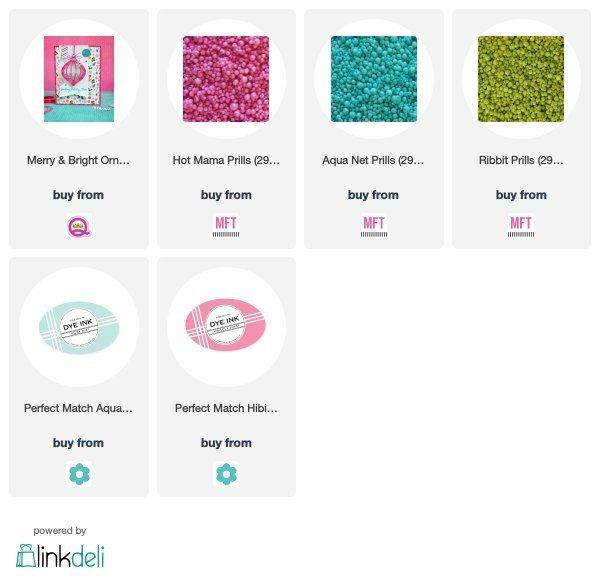 But what's so great about these foamies is that you could use anything you have on hand, like seed beads, glitter, or all the beautiful little trimmings already included in the kit. 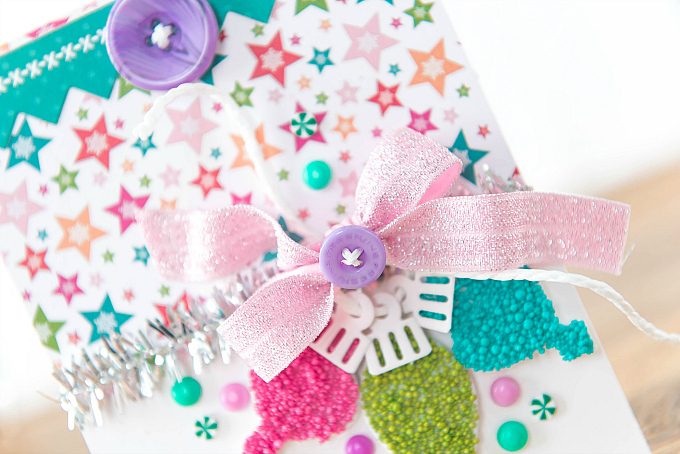 Stay tuned for an upcoming card using pearlies included in the kit. To finish off my colorful card, I stamped a sentiment using stamps from the kit, and also added a few melted perler beads and the darling candy embellies. I'd love to hear from you - Do you try to use your leftovers? And if so, what is your favorite way to decorate/use them? Thanks so much for joining me today and happy crafting to you! Thank you my dear friend! It's fun to step outside traditional colors for a bit and add a bit of color to the holidays! How clever is this? I LOVE that you used the shakers to make Christmas lights. This is so lovely!! Oh my goodness--I adore the look of your ornaments, Ivana! Now I wish I'd gotten some prills when I saw them on sale! Oh I know! I saw the sale too, but missed it. But I've got a few colors to play with so I really can't complain! Thanks so much for all of your visits, sweet friend!